Hearing loss is one of the most common disorder that can affect newborns, with a rate of one affected child on every 1000 births. A normal speech development is desired for these patients and can be reached when early diagnosed and treated. Hearing aids are a well-known tool to help patients to achieve this objective, however, different types of hearing loss will require another types of rehabilitation. One particular type of sensorineural hearing loss (when there is an impairment of the transmission of sounds through the auditory nerve) is the auditory neuropathy spectrum disorder. It is caused by a change in the function of the inner hair cells of the cochlea and/or the involvement of the auditory nerve fibers with dyssynchrony in this nerve conduction. There is no clear cause of auditory neuropathy, but many studies have shown a relationship with hereditary neurological disorders. Cochlear implantation is widely accepted for the treatment of severe to profound sensorineural hearing loss since its approval in 1990 by the Food and Drug Administration. Children under 6 years with bilateral severe to profound hearing loss and no benefits from conventional hearing aids may be candidates for cochlear implantation. The speech perception test has become the gold standard for objectively measure the outcomes after cochlear implantation in adults. For children, observations of their behavior and responses to auditory stimuli are used for clinical evaluation as well. Additionally, life quality of the patients fitted with hearing aids or cochlear implants is also evaluated by several questionnaires. 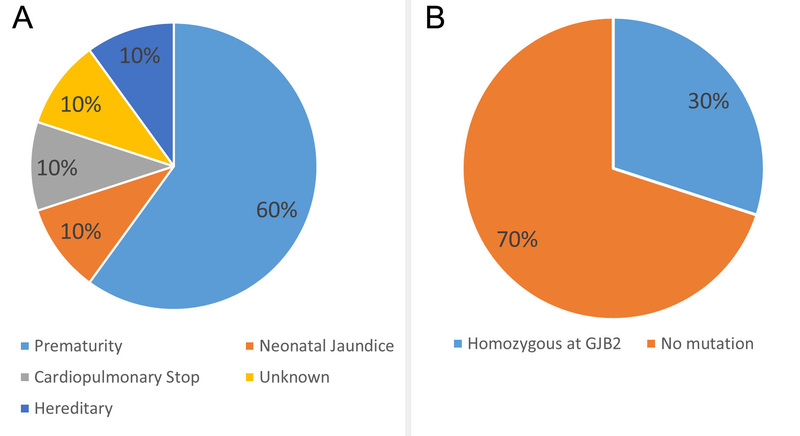 Patients diagnosed with auditory neuropathy that underwent to a cochlear implantation were evaluated by means of audiological assessment, satisfaction with amplification in daily life questionnaire, and molecular study screening for GJB2 mutations. 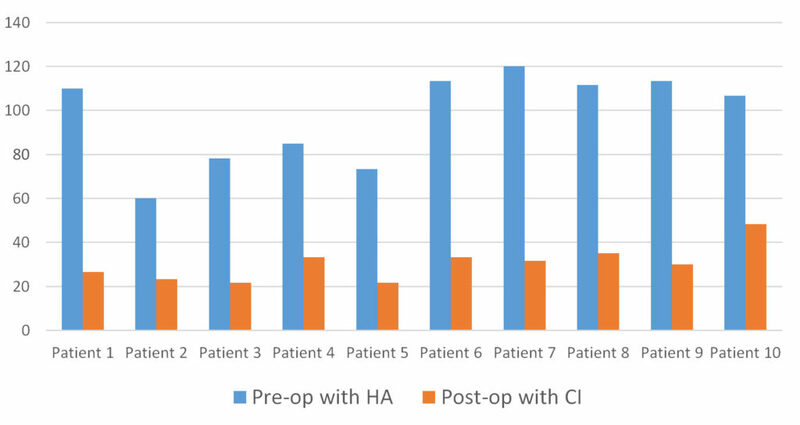 In this study, 10 patients (7 males and 3 females) were evaluated pre- and post-operatively: average age of patients at the moment of surgery was 4 years and 4 months; average time of cochlear implant use was 5 years and 3 months. All of the patients were positive for c.35delG mutation, at connexin 26 (GJB2) gene. Finally, overall satisfaction score was 8 (ranging 0-10), showing that patients with auditory neuropathy fitted with cochlear implants consider themselves satisfied with the positive effects (acoustic and psychological benefits), service and value (professional competence, product price, and number of repairs), negative factors (environmental noise amplification and phone use), and personal image (esthetics and stigma of using the device). Satisfaction of Children with Auditory Neuropathy and Cochlear Implant.